Undefeated duo Missy Cummings and The Huntress are headed for the Inglis Race Series riches on offer during the two day Scone Carnival next month following black-type wins on Saturday. Missy Cummings ($80,000 2011 Premier, 3f Magnus x Lady Knockout) defied her rivals all the way to the line in the Listed ATC James HB Carr Stakes over 1400m for three-year-old fillies at Randwick. Undefeated in all three of her career starts, Missy Cummings will now be aimed at the $500,000 RL Inglis Guineas on the second day of the Scone Carnival, Saturday 18 May. The daughter of Magnus (pictured) was purchased by her trainer Anthony Cummings for $80,000 from the consignment of Eliza Park Stud at the 2011 Inglis Melbourne Premier Yearling Sale. 13 yearlings by Missy Cummings’ sire Magnus will be offered at the new Inglis VOBIS Gold Yearling Sale tomorrow 28 April and Monday 29 April in Melbourne. CLICK HERE to view their pedigrees. 15 minutes later in Melbourne The Huntress ($36,000 2012 Scone, 2f Husson-Western Empress) booked herself a float trip to Scone with an impressive victory in the Listed MRC Catanach’s Jewellers Stakes over 1200m at Caulfield. The Mick Kent trainer filly copped a few bumps around the turn, but her professional manners shone through as she dug deep and found the line like a very progressive two-year-old. The daughter of Husson was purchased with the $100,000 Inglis Challenge at Scone in mind at last year’s Inglis Scone Yearling Sale for $36,000 from the draft of Middlebrook Valley Lodge. "We bought her at Scone, so it's always been the plan to go back there for the rich race they run for Inglis graduates, so that's where we will be going in three weeks’ time,” said stable representative Craig Arrowsmith. Restricted to horses offered at the 2012 Inglis Scone Yearling Sale and 2012 Inglis Australian Bloodstock Sale, the 2013 Inglis Challenge for will be run over 1100m on Scone Cup Day, Friday 17 May. 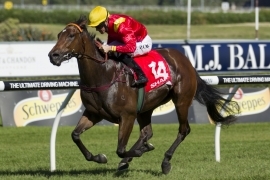 The Scone Race Club’s two-day carnival on Friday 17 and Saturday 18 May is flanked by two Inglis Sales at White Park; the Inglis Scone Thoroughbred Sale on Thursday 16 May and Inglis Scone Yearling Sale on Sunday 19 May.